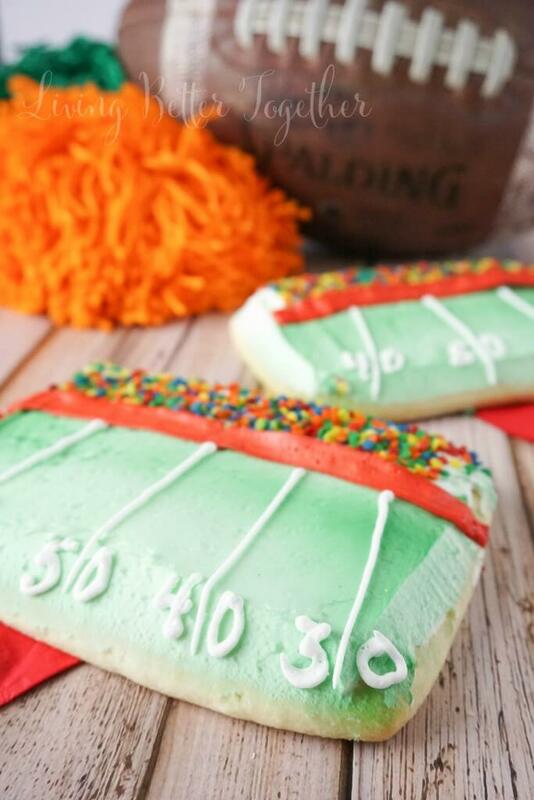 These Football Stadium Sugar Cookies are so easy to make and they’re going to be the talk of the party during playoff season! It’s football playoff season, which means that most of you are spending your weekends cheering and screaming at your TV screens. But you can’t scream at the refs on an empty stomach now can you? 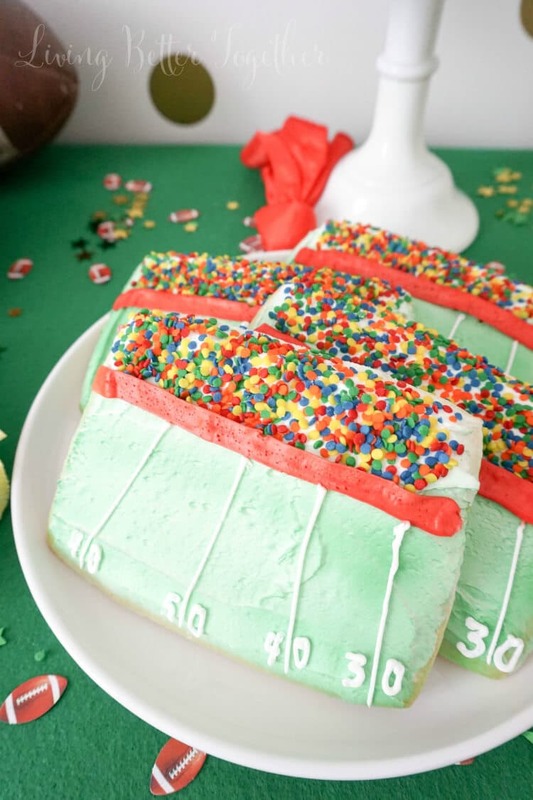 Don’t worry, I’ve got you covered with these SUPER fun Football Stadium Sugar Cookies. Made from my grandmother’s sugar cookie and royal icing recipes, these cookies beg to be eaten. But then I went and decorated them up and they’re almost too cute to eat, but you’re going to eat them anyway because let’s face it, they’re cookies… with frosting… and sprinkles. But seriously, how cute are these cookies!? They actually look like a football stadium. Just admit it, they’re très adorbs and you want them all! Plus when you make them, all your friends will go gaga over them and you’ll be a football party hero! Yes, these cookies totally equal hero status! You could easily make these a soccer field too, or do them as squares instead of rectangles for baseball fields. They’re just so fun to make and everyone always loves them! You really just can’t go wrong with an old fashion sugar cookie frosted in anticipation for the big game! 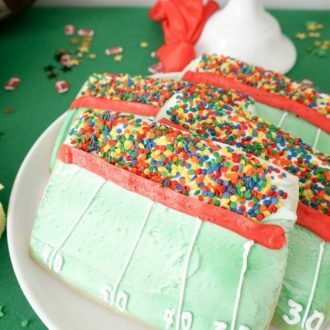 Keep scrolling for more great game day party recipes, printables, and decor ideas from some of my bloggy friends! Simple sugar cookies that are so easy to make but pack a major WOW factor for game days! In a large bowl or stand mixer, cream together shortening and sugar until light and fluffy. Add eggs and vanilla and beat until well blended and smooth. Sift together flour, salt, baking powder, and baking soda and slowly add to creamed mixture. Chill dough for at least 3 hours. Roll dough to ¼ inch thickness on a lightly floured board. Use a floured square cookie cutter to cut out cookies, these were jumbo 4 x 6 cookies, I've made 2 x 3 inch ones as well and that's probably what I'll make for our Super Bowl party. Once you cut cookies out of dough, mold back together and repeat process until dough is gone. Place cookies on a parchment lined baking sheet and bake for 10-12 minutes, edges will start to turn a golden brown when done. Add ingredients to a stand mixer, do not use a hand mixer, and beat for 15 minutes until still peaks form. Divide frosting into a 1/4 cup for white, 1/2 cup for red, and the rest will be green. Mix with food coloring until you reach desired tones. Use a frosting spatula to spread green frosting over the entire cookie. Add red frosting to a decorating tool or bag with a flat tip and frost a strip across the cookies lengthwise, there should be about 1/3 of the cookie above the line. Add white frosting to a decorating tool or bag with a fine point tip and draw out yard lines in the large section below the red line. Sprinkle confetti sprinkles on the frosting in the top 1/3 of the cookie above the red line to create your crazy and wild fans! You can use any white frosting, homemade or store bought. You can use rainbow colored nonpareils instead of confetti sprinkles for the stands. You can use sprinkles in team colors too! I love this cookies! Perfect treat for game day! Thanks for hosting! I love sugar cookies and I’ve never seen any like this. These are cute!!! How clever! These are adorable Rebecca, you’re so creative! These cookies are so cute! And how appropriate to make them for the big game day that will soon be here. Thank you so much for sharing this recipe! You are most welcome, thanks so much for stopping by! These are so cute- I wish I could do something like this- I’m terrible at cut out cookies- I screw them up every time! You can totally do these, all it is is a rectangle and they’re so fun! Omg!! I absolutely love these! I bet they’d disappear so fast at my game day parties! So adorable, and so delicious! 🙂 Pinned! Thanks, Anna! They’re so fun to make and eat! They were the first thing to go, even faster than the chocolate cupcakes! Cute, Cute, CUTE! How fun are these! Thanks for sharing at OMHG WW this week! 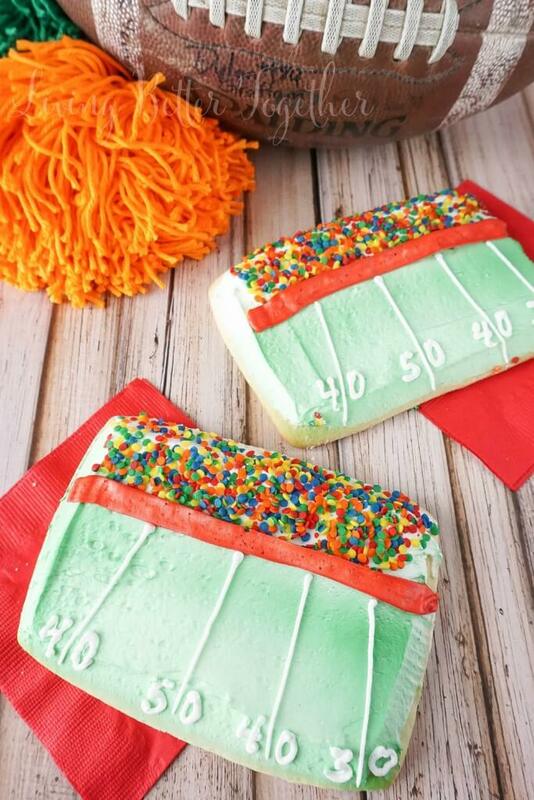 Everyone must have Football Stadium Cookies while watching every game. They are so cute and of course I agree everyone will love them. Give the kiddies a glass of milk and get the cheering going! Thanks so much for sharing with Foodie Friends Friday party this week. We hope you will join us again with another delicious treat! How sweet are these??? Love them so much. 🙂 Thanks for linking up to Snickerdoodle Sunday- hope to see you again this Saturday at 5:00 ET with your latest makes! Thanks so much, Sarah! I’ll be by!